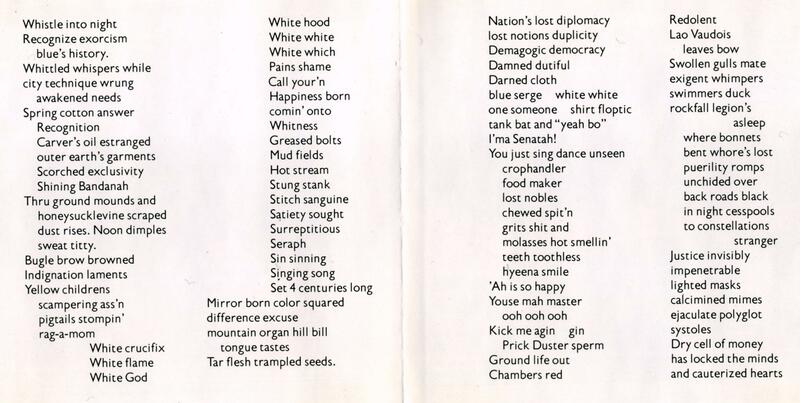 The liner notes to Cecil Taylor’s solo piano album Indent include the poem pictured above. 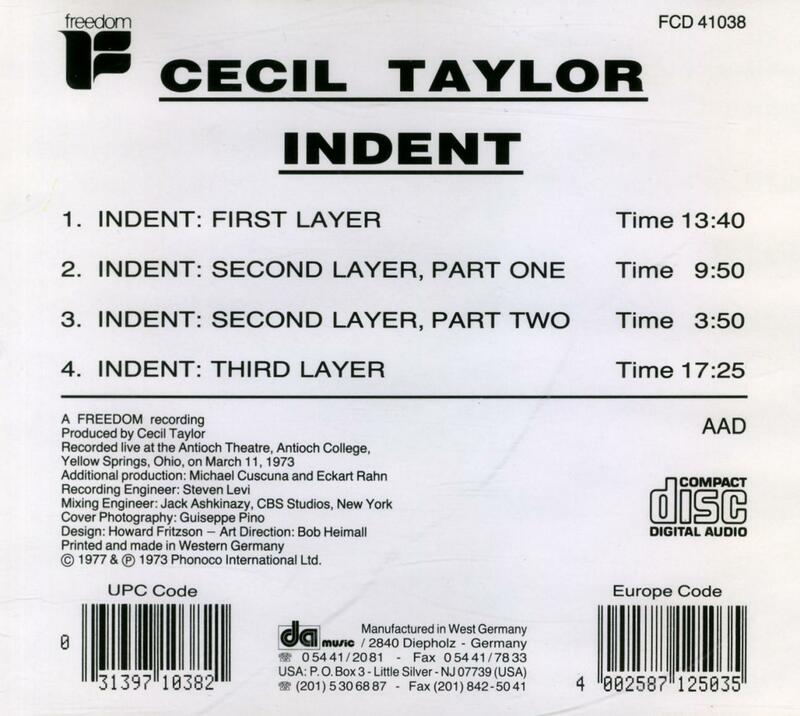 Cecil Taylor’s early bebop work includes recordings with John Coltrane released eventually in album form. But even the ground-breaking context of bebop would prove too restrictive for Taylor. 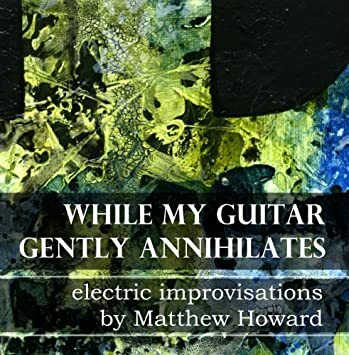 Works like the Great Paris Concert take the instrumentation of a bebop quartet to perform what sounds like almost completely free and unstructured music. But, one suspects that Taylor has his own ideas of structure, and that jazz merely served as a starting point. The lack of any recognizable song forms and the energetic chaos erupting in waves from Cecil’s piano will most likely appeal only to the most adventurous listeners. We recommend listening without preconceptions or expectations, letting the sound wash over you like a symphony. 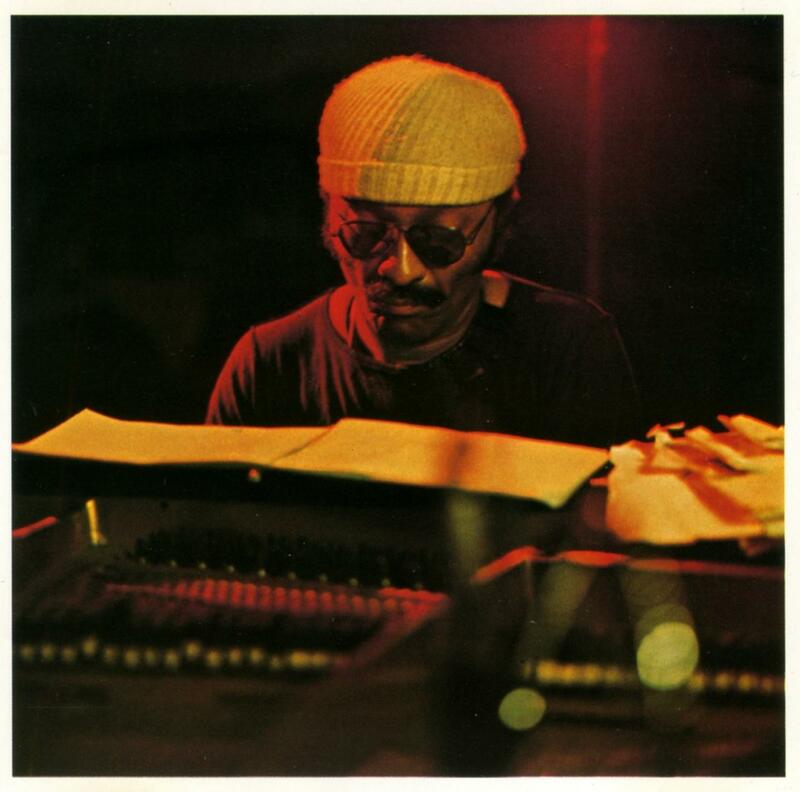 Cecil Taylor recorded this performance in March, 1973, at Antioch College in Yellow Springs, Ohio according to the liner notes. If we recall correctly, he had a teaching or fellowship position there, though we can’t find much information on that now. When we discovered this album in the early 1990s as jazz DJs at a college radio station, this amused us. Our grandmother had taken us to Yellow Springs during summers in the mid 1980s when we would visit her. It had many new age bookstores and art, a kind of hippie haven in an otherwise conservative midwestern state. You could buy crystals and meditation music in mom-and-pop shops. But what was it like when Taylor was there in 1973, recording this concert, less than two months after we were born? We can only imagine. 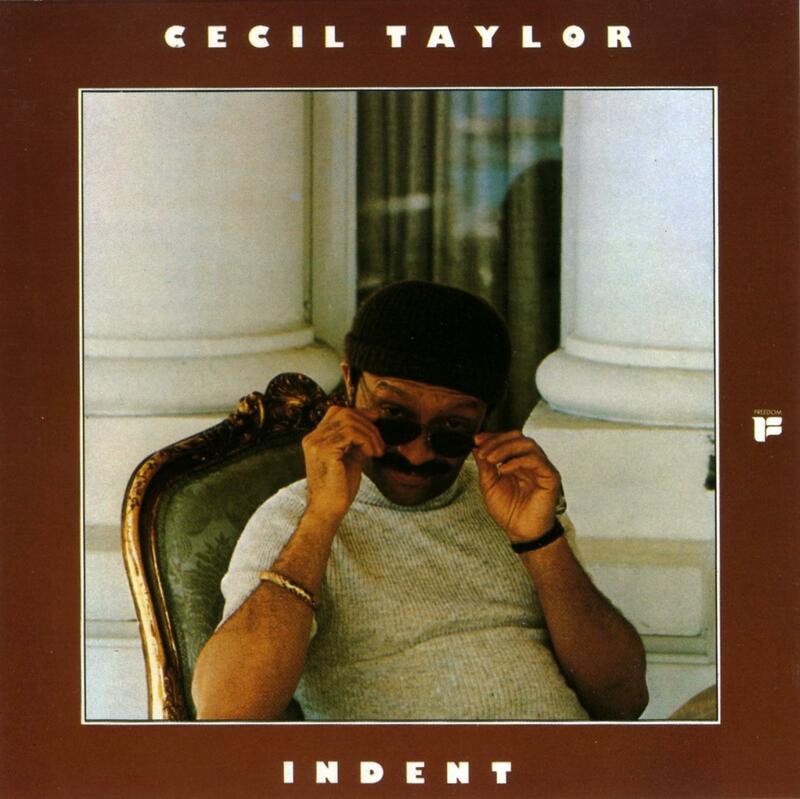 – From Indent by Cecil Taylor; Freedom, 1977. You can find the most current version of this article as a free PDF download. In an interview with Musician, Wynton Marsalis draws attention to a common shortcoming in jazz music reviews: writers on the subject do not understand the basic technical elements of the music they critique. Wynton claims, “Ornette Coleman sounds like Bird. He was playing rhythm changes on The Shape of Jazz to Come. Have I ever read that by anybody reviewing those albums? No. Why? Because they don’t know what rhythm changes sound like” (Zabor, 1985). As Wynton might agree, a music writer needs enough technical and historical background to understand both the artist’s intent and the tradition of the music. Understanding the chord patterns of rhythm changes and their development in modern jazz empowers the music writer to better understand jazz, to enjoy it more, and to communicate about it more knowledgably. Because our audience consists of writers, not musicians, we will avoid most traditional musical symbols. Instead, we will explain the ideas simply without teaching a new alphabet of symbols. Without a technical background, even the term “rhythm changes” may cause confusion. It sounds like it refers to changing the rhythm of the song, perhaps by altering the tempo or the meter. 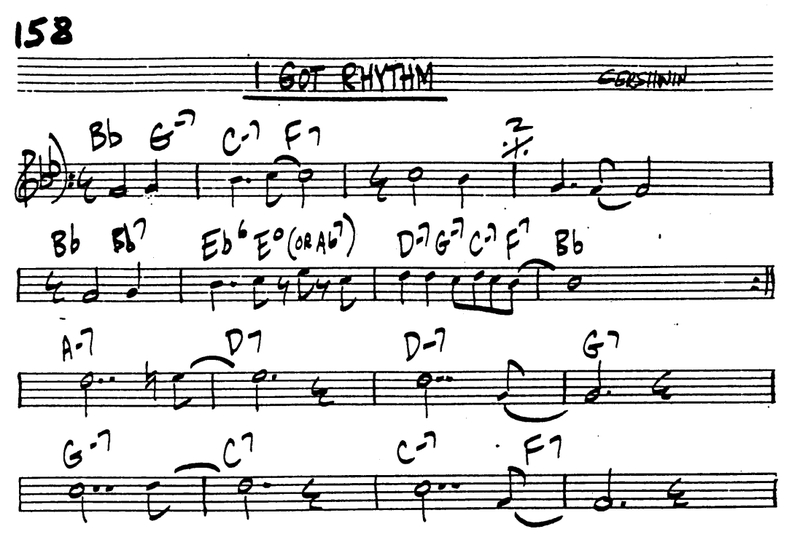 But in reality, it describes a set of chord changes based on George Gershwin’s song, I Got Rhythm. With that in mind, let us develop an understanding of this set of chord changes, moving from simple elements to the more complex. To begin, rhythm changes demonstrate one of the fundamental building blocks of jazz: the strong resolution of the Dominant chord to the Tonic chord. In a basic blues form, the Tonic chord represents the key signature of the song. The Dominant chord is built on the fifth scale tone of that key, and is typically played as a dominant seventh chord. In the key of C Major, for example, C is the tonic note. Expressed as a dominant seventh chord, our Tonic chord is C7. The Dominant chord, then, is G7, built on G, the fifth scale tone of C major. One can easily hear on a guitar or piano the resolution when a C7 chord follows a G7. Jazz takes this idea from the blues and logically extends it. If the strongest resolution happens when the Dominant chord moves to the Tonic, asks jazz, then why not create structures of continually resolving movements? Consider our key of C Major again. We have our Dominant chord as G7. Jazz takes G7 as a new starting point, a new Tonic, and then finds its Dominant chord; in this case, D7. D7 resolves to G7 in the same way that G7 resolves to C7. If we resolve D7 to G7 and then G7 to C7, we have completed the basic chord sequence of jazz. Jazz musicians often call this a “two five one,” because the note D is the “two” or second note of the original key – C Major in this example. This is the most common harmonic movement in jazz. Its most common variation replaces the D7 with a Dm7. Jazz often extends the idea yet again to get a set of four chords. Continuing our example, we can treat D7 as a new Tonic and find its Dominant chord: A7. The complete sequence, played as a series of chords, is now A7 to D7 to G7 to C7. Musicians may call this a “six two five,” because, in our original C Major tonality, A is the sixth note of the C Major scale. If you play this sequence on a guitar or piano, you may notice that you have heard similar movements in a slew of popular tunes from blues and jazz to country and rock. It also forms the harmonic backbone of rhythm changes. The most important chords of the first four measures are the Tonic, B♭, and its Dominant chord, F7. To make it more interesting, the chords Gm7 and Cm7 come between them. This creates a Dominant-to-Tonic resolution from G to C, then from C to F, and finally from F back to the song’s original Tonic, B♭ (See Appendix 1). Measures five and six create the same pattern of resolutions: from B♭ to E♭ to A♭. While it may seem like a change in keys, all three chords are standard chords in a B♭ blues. Measures seven and eight create a “six two five” resolution ending on the Tonic, B♭. D resolves to G, G to C, C to F, and F to B♭. The second section of the tune, beginning on A, restates this same movement over eight measures. The A resolves down to D then follows the same cycle of resolutions. It does not end on B♭, however, as the form will predictably begin there on the next verse. This logical sequence, while perhaps unfamiliar to those who have not studied harmony, makes perfect sense to a jazz musician – so much sense, in fact, that it spread across the country like wildfire. In 1932, two years after I Got Rhythm first appeared on stage, Sidney Bechet used the chord changes in his recording: Shag (Harrison, p. 432). Bechet’s band does not play Gershwin’s melody. In fact, they barely have a “head” or opening melody at all, diving instead into a group improvisation based on the chords (SoundJunction). Listening to Shag, one should listen for the same overall motion or resolution sequences as I Got Rhythm. Understand that according to U.S. copyright law, composers may copyright melodies and lyric but not chord progressions. Therefore, musicians may appropriate the chords for their own melodies or improvisations. At the time, jazz musicians commonly borrowed chord sequences, including those of Tiger Rag and Moten Swing (Williams, 1989). 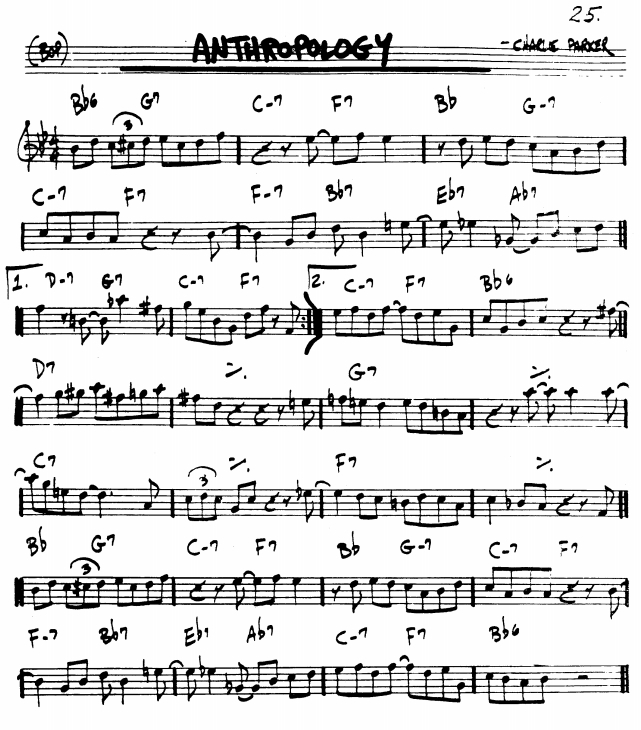 In this atmosphere of “open source” chord progressions, Charlie Parker appropriated I Got Rhythm for his seminal bebop tune, Anthropology, with a few customizations. He sometimes uses a minor seventh chord (Gm7) rather than a dominant seventh (G7), and he omits the A chord at the beginning of the second section (measure nine). He also adds a different ending for the second repetition of the “verse,” or first eight measures (See Appendix 2). But, underneath the melodies, the chords essentially follow the same pattern of resolution. 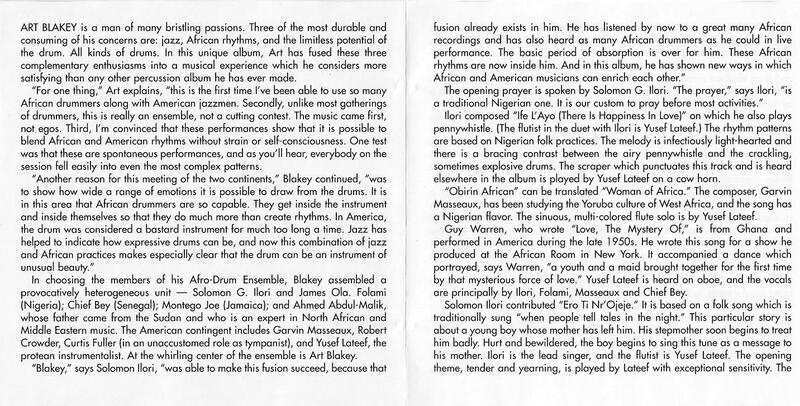 According to Wynton Marsalis, Ornette Coleman used a similar approach on his album, The Shape of Jazz to Come. His group improvisations, Wynton claims, follow rhythm changes. Reviews of Coleman’s 1959 album consistently state the importance of The Shape of Jazz to Come lies in its abandonment of strictly outlined chord progressions and completely “free” improvisation. Wynton, however, urges us to listen closely and more knowledgeably to hear the musicians playing within a tradition of rhythm changes. To Be Ornette to Be? Armed with this understanding of rhythm changes, a writer may develop a deeper understanding of jazz. But what of Wynton’s claim about The Shape of Jazz to Come? While Wynton’s expertise and theoretical knowledge give us no reason to doubt his claim, listeners may have some problems verifying it due to Ornette’s idiosyncratic style. Even a cursory review of the first track, Lonely Woman, reveals that Wynton certainly did not refer to it. Its passages of relatively simple D minor tonality have nothing to do with rhythm changes. However, Congeniality, despite its tempo changes, sounds very much like standard bebop. Its solo sections, like those of the final tune Chronology, swing along very much like bebop. After several listens to the album, one finds it difficult to believe statements about its abandonment of chord changes. 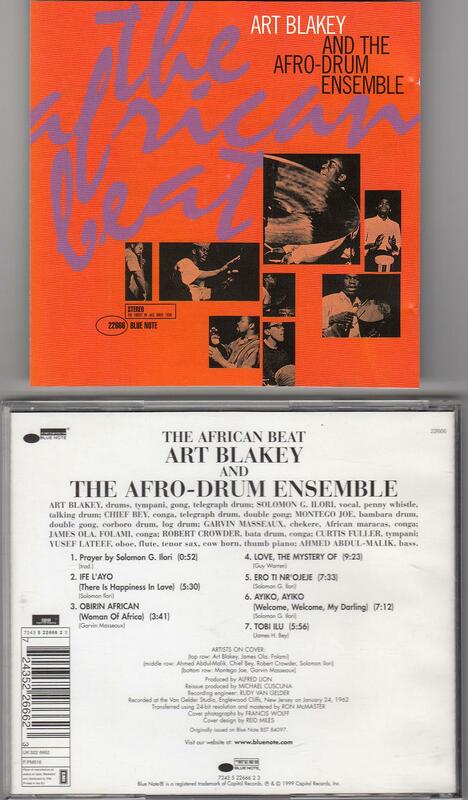 It seems much more likely that the musicians simply did not write down the chord changes, emulating the bebop style “by ear.” Each of Coleman’s collaborators on the album, accomplished musicians in their own right, certainly did not need a chart to play basic jazz chords and melodies. To such musicians, improvising a line based on rhythm changes would come naturally. Rhythm changes do crop up in other works by Ornette Coleman. However, he often shortened the form by omitting one or more measures. He also seemed to improvise in the style of rhythm changes, but in a different key from the rest of the band. For a more thorough analysis of Ornette’s music, see Jari Perkiömäki’s 2002 doctoral thesis for Sibelius Academy, Lennie and Ornette, at http://ethesis.siba.fi/ethesis/files/nbnfife20031086.pdf. If we approach jazz culturally, we seek to understand any given recording in terms of the traditions that gave rise to it. Shag exemplifies the Dixieland era’s approach to rhythm changes, while Anthropology demonstrates a bebop approach. Ornette and other modern jazz pioneers may have played “free” or “outside” music, but they came from this same tradition. Sometimes what seems “outside” to the untrained ear relies on tradition for its underlying structure. Writers, when possible, should seek out a composition’s chord chart and identify the Dominant-to-Tonic resolutions inside it. While it can be difficult to identify chords by ear in a fast-paced performance or recording, seeing the charts makes it quite easy. Hearing the chord progression played on a guitar or piano, without all the soloing and embellishment, also helps one hear the overall movements of the song. If a writer does not play guitar or piano, perhaps a friend or colleague can play the basic chords. This level of structural analysis remains absent from most jazz critique. Writers, often non-musicians, can only write their impressions of what music sounds like. This compares to writing about architecture based strictly on what the outside of buildings look like, without understanding the inner structure. The professional writer, therefore, will strive to understand and hear more like a musician. Seek to understand the internal logic of the music as much as its subjective effect. The basic structure of rhythm changes and patterns of Dominant-to-Tonic resolutions underlie a great number of songs in both traditional and experimental recordings. If one cannot pick them out by listening, then one must train the ear and the mind. In the end, taking the time to learn about the music one critiques will bring a deeper appreciation, and a more thorough understanding. Gershwin, G. (1996). I got rhythm. The complete Gershwin keyboard works. 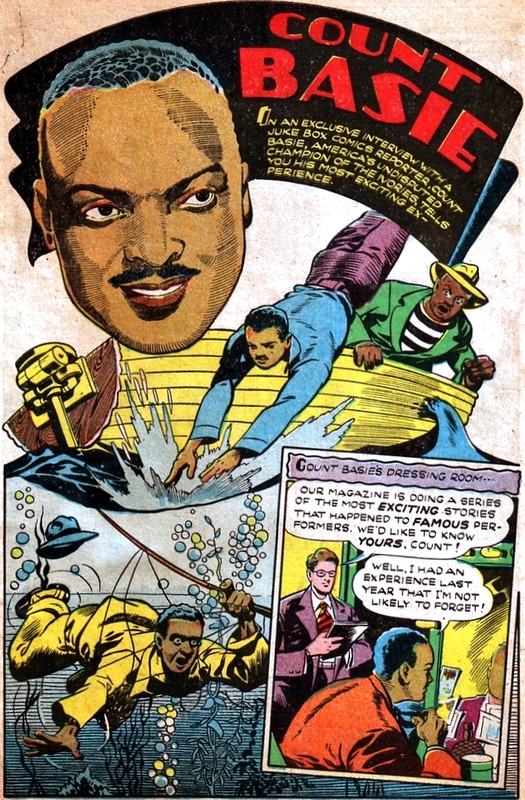 WB Music Corp., ISBN 029156298383. (original copyright 1930?). Chart obtained from Jazz Ltd fake book. Parker, C. and Gillespie, D. (1945). Anthropology. Chart obtained from The Real Book 1. SoundJunction. Sidney Bechet: wild jazz wanderer. Retreived from http://www.soundjunction.org/sidneybechetwildjazzwanderer.aspa, October 25, 2013. Includes audio sample. Williams, M. (1989). Jazz in its time. New York: Oxford Press. Qtd. in Crawford, R. and Magee, J., Jazz Standards on Record, 1900-1942: A Core Repertory. “He goes on to call Shag by Sidney Bechet ‘the first of hundreds (thousands?) of new I Got Rhythm themes to come.’” Also notes that this was common practice including standards like Tiger Rag and Moten Swing.